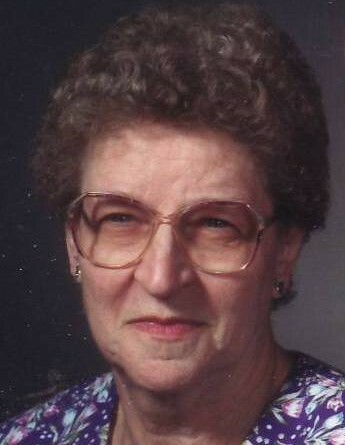 Mary Lou Eames, age 84, of Kimmell, died Wednesday, October 3, 2018 at Miller’s Merry Manor, Syracuse. Mrs. Eames was born in Kimmell, Indiana on August 20, 1934 to the late Charles Laurence Beers and Laura Alice (Werker) Beers. She graduated from Cromwell High School in 1952 and married Robert Eugene Eames on December 24, 1953 in Burr Oak, Indiana. Robert preceded her in death on May 11, 2017. Mary was a homemaker later in life but earlier she worked in the cafeteria at Cromwell Elementary School, Lyle Electric, Royal Imprint and Miller’s Merry Manor. She enjoyed crocheting, puzzle books, and reading. Son, Kenneth and Sue Eames of Fort Wayne. Son, Dennis Eames of Cromwell. Son, Daniel and Erica Eames of Peru. 10 grandchildren and 13 great grandchildren. Brother, Alan and Sharon Beers of Kimmell. Brother, Charles and Sue Beers of Kimmell. Sister, Janette Wilcox of Ohio. She was preceded in death by her son, James Eames in August of 2013 and brother, David Beers in November of 2014. Visitation will be Friday from 4:00 – 8:00 PM at Hite Funeral Home in Kendallville. A funeral service and burial will take place Saturday, October 6, 2018 at 11:00 AM at Sparta Cemetery with Pastor Jeff Lawson of Premier Hospice officiating. Memorial donations may be made to Premier Hospice of Fort Wayne.